Includes local in town delivery. This lily bouquet is certainly in voque. Asiatic lilies are long listing and fun to watch as each bloom opens. 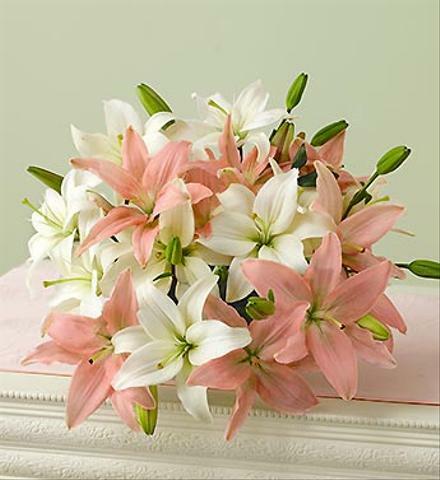 Lilies are available year round in many locations. . Add a vase at checkout and the floral designer will arrange the lily stems in a suitable vase that is in stock. . Euro Style Hand Tied Cut Bouquet - Asiatic Lily Bouquet Color Choice Gift Wrapped. 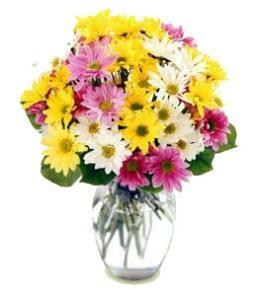 This is a special product that is only available in the Brant Florist local delivery area. Product/Pricing for delivery in USA. View Prices in Canadian Dollars. Choose Other Delivery Destination. No thanks, I don't want any add-ons. Warning: The current promo discount is not applicable to your chosen Delivery Date. In order to qualify for the Promo you would need to select a delivery date not greater than: May 08, 2019 Sunday delivery is usually available in major cities and some regions. We will request Sunday delivery on your behalf, however if it is not available, your order will be delivered on Saturday if received soon enough otherwise your order will be delivered the following Monday or Tuesday if Monday is a holiday. Great! We'll attempt to deliver the flowers on your preferred date but we may end up delivering it on . Active Promo Code: 19APR - 19APR is in effect. Sunday delivery available most larger cities including our own delivery area. Using goods available on hand in stock, allows florists to make same day gift delivery and next day gift delivery for almost all orders. If the specific flowers, container, plants or gift items for your order are not in stock, then it will be necessary to substitute in order to complete same day or next day flower delivery. The florist may be able to order specific in season flowers or plants for your order from a wholesaler or grower which may take 3 to 7 business days. This only applies to orders where you have ordered early enough and allowed enough time. Special containers usually cannot be ordered in advance. 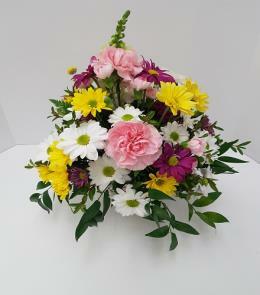 Standard - The floral arrangement is designed to look similar1 to the 'Standard' price level's product photo. 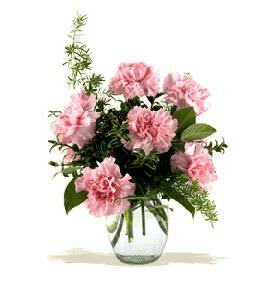 The Standard size typically has fewer flowers as it is a more basic arrangement. 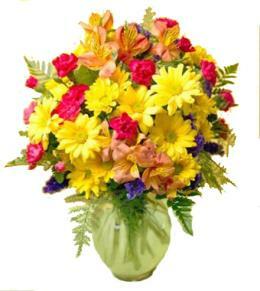 Deluxe - The floral arrangement is designed to look similar1 to the 'Deluxe' price level's product photo. 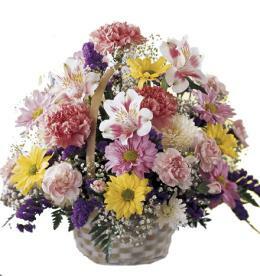 The Deluxe size typically has an upgrade of more flowers and/or more expensive flowers added to the value of the arrangement. Premium - The floral arrangement is designed to look similar1 to the 'Premium' price level's product photo. The Premium size typically has a substantial upgrade of more flowers and/or more expensive flowers added to the value of the arrangement. 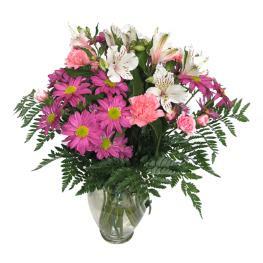 Exquisite - The floral arrangement is designed to look similar1 to the 'Exquisite' price level's product photo. The best showing. This will be the most flowers (or other product) arranged to show a much enhanced presentation. It will usually be larger and or include more expensive unique flowers. But it will be very tasteful and not be ostentatious. Specific differences between the product levels are shown in the note below the price info beside each product thumbnail. Learn more about product images and product price levels. You can supply the complete address and phone numbers for the gift recipient during the checkout process. A recipient cell number is often the best way to ensure the driver can actually reach the recipient and deliver properly and safely. If applicable, you may add a Large Card, Mylar Balloons, Teddy Bears, Chocolates, Stuffed Animals, Glass Vase and Script Ribbon to this gift. In general, orders received by 2:00 PM local delivery time week days of the recipient (earlier during peak holidays) can be delivered the same day in North America. Saturday and Sunday orders should be in by 12 noon. Orders going to funeral homes always receive special delivery attention and every effort is made to be there for the visitation or service time. Sunday delivery is available in most larger cities across Canada and the US, including our own local wide delivery area. Call or Email us for details or to be sure. Most international countries do not offer Sunday delivery, but again you may Call or Email us so we can look into it for you. We can take your order by phone if you are not comfortable completing your order online. Or you may place your order online and choose to phone or fax in your credit card number. You can even email your order details. A small service charge of $9.95 may apply to each phone order. We accept payments with most major Credit and Debit Cards: Visa, MasterCard, American Express, Discover. We also accept PayPal™, Interac® Online and Interac® e-Transfer®. When paying by for your Completed Online Order by Credit Card you can either Pay Online secure encrypted (by entering your Credit Card info) or Phone In or Fax In your Credit Card info.